The initial discovery, it must be said, was entirely accidental. I was working on some graphics for a smartphone app about Stonehenge, and we needed some imagery for the Bluestonehenge section. We were hoping to use the paint & paper reconstruction of a well-known artist, but he was on holiday at the time and we needed something right away, so I resurrected an old Sketchup model I’d made back in 2009, and dropped it onto an image taken by Adam Stanford during the excavation – like every other reconstruction to date, it was round. I then took a couple of screengrabs and emailed them to Adam so he could see them while we discussed the matter during a video chat. He made all the right encouraging noises, but pointed out that I’d missed the hole on the far right. This prompted me to return to the model and increase its circumference to take in the ‘extra’ hole. Now it looked too large, and it didn’t really fit all that well. 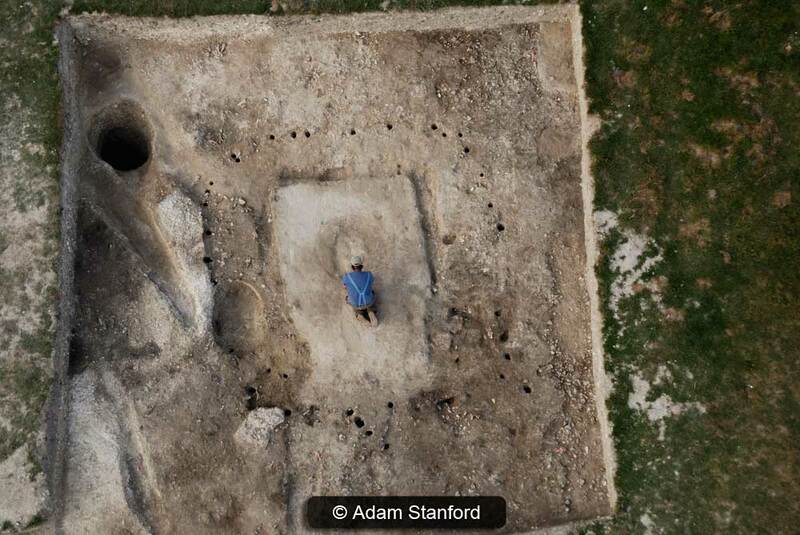 Aerial shot of the Bluestonehenge excavation with digital stones in place – Image © Adam Stanford – Model by Henry Rothwell. 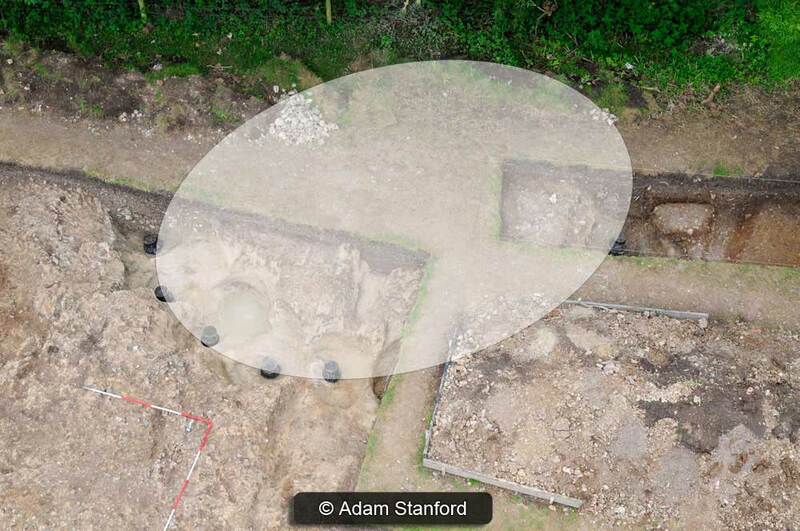 Aerial shot of the Bluestonehenge excavation with oval overlay – © Adam Stanford. 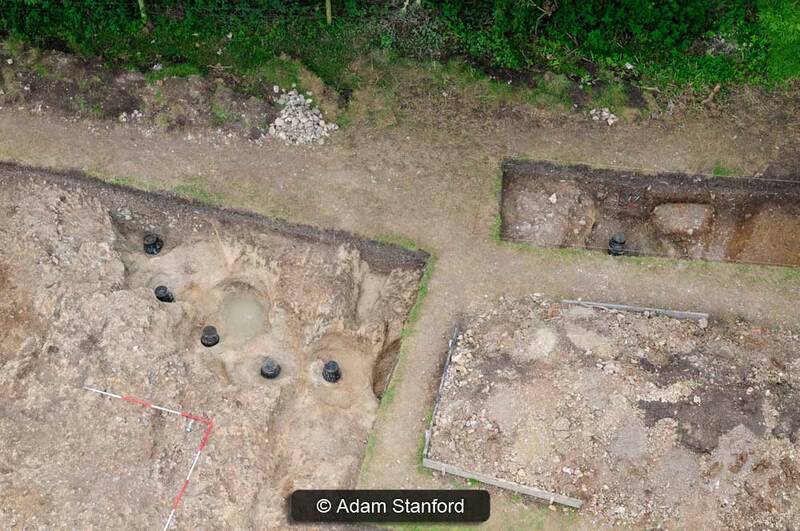 Aerial shot of the Bluestonehenge excavation – © Adam Stanford. To get to the bottom of it I went back to the beginning, opened Adam’s image in Photoshop and began experimenting with the elliptical marquee tool to get an idea of the possible layout of the unexcavated post holes. It quickly became apparent that an oval layout matched the excavated holes far better than a circle did. Having kept back a single pillar from the original model, I then rebuilt Bluestonehenge as an oval. It worked, I took a couple of screenshots, sent them to Adam and then posted them on my blog with a short write-up, thinking it was an observation that other people might find interesting. I also mailed a couple of people who I knew were involved with the dig to get their opinions. The Comparisons – Stonehenge, Woodhenge and Bedd Arthur? One of the people who responded first was Mike Pitts, who discussed the new model on his blog (Digging Deeper). One of the things he wrote that particularly caught my attention was that a “corollary of being oval, rather than circular, is that you have an orientation” (Pitts, 2011). He also mentioned two other ovals in the area – the one inside Stonehenge, and the one at Woodhenge. I had models of both knocking around on my hard-drive, so I brought them up and pasted my oval into the models. 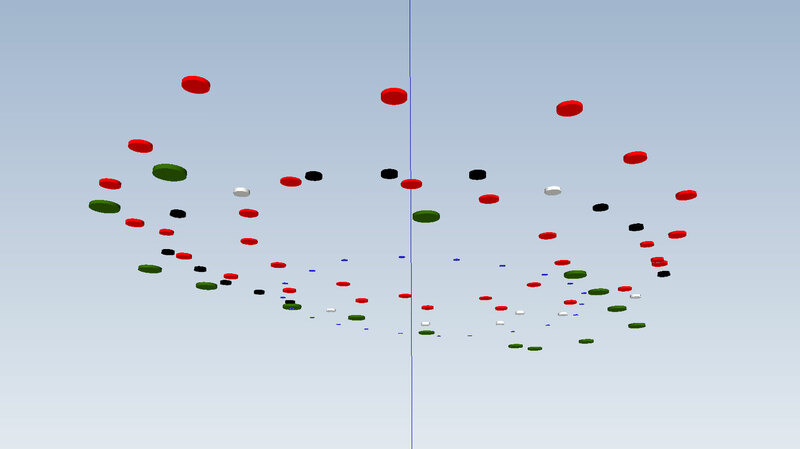 All the models were geocoded, so I knew that the orientations would be as they were in the real world. I tried Stonehenge first, and, in an eyebrow raising moment, saw that my oval fitted the Bluestone Oval exactly in size, shape and orientation. Overlaid sites in Sketchup. See PDF for key. The size would change in a later revision, but the shape and orientation – arguably more important than size – was a particularly good match. I then tried the same experiment with Woodhenge, and got a very similar result – my oval was slightly larger than the central oval at Woodhenge, but the alignment and shape was an excellent match. Again, the size would change, but again, the shape and orientation wouldn’t. Following the suggestion of a follower on the Digital Digging Facebook page, I had a look at another bluestone oval, that of Bedd Arthur. I couldn’t find any site plans (I understand not a great deal of work has been done at the site) so had to build a model using perpendicular satellite images, and photographs taken from the ground. This isn’t an ideal method – it’s always good to have a site-plan to hand – but it can result in a perfectly good approximation for a working model. The match this time wasn’t so good – the alignment was fine, but the shape was very different. Bedd Arthur is more of an elongated tear-drop than an oval, and also displays a much lesser degree of symmetry than any of the other sites mentioned here. It is, none-the-less, of interest that its orientation, size, and the material used in its construction are the same as the Bluestone Oval at Stonehenge and may be worthy of further consideration. So they line up, and are the same shape – what of it? Well here is where it gets tricky. Stonehenge and Woodhenge are famously aligned on the mid-summer and mid-winter solstices. 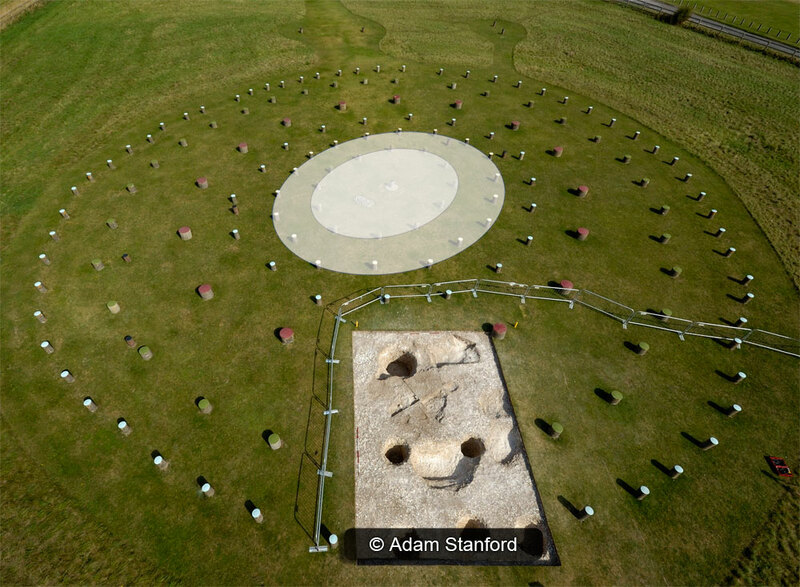 If the new model of Bluestonehenge is correct, it also shares this alignment. Essentially, it would add weight to the hypothesis that Durrington Walls and Stonehenge were connected – here are three oval shaped monuments sharing a common alignment and connected via the river Avon. Wait – back to the alignment thing – is it significant? 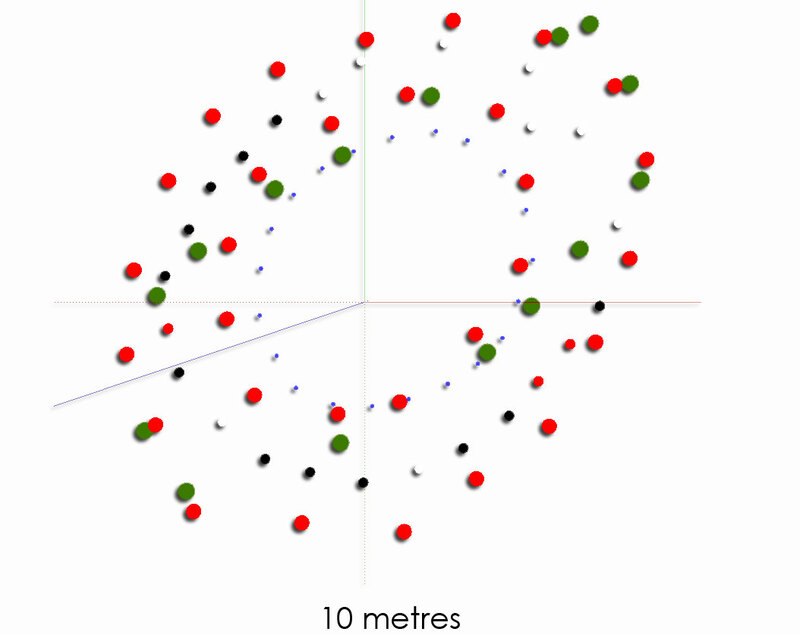 Possibly – but alignments can be very misleading. Consider for instance the phenomena of Manhattanhenge. On dates in May and July, and January and December, the sunset/sunrise lines up perfectly with the grid street system of Manhattan. The phenomenon of the sun rising or descending between the artificial canyon walls of the city’s skyscrapers is enough to draw a crowd of awed spectators. I doubt many of them believe that the designers of Manhattan did it on purpose. It just so happens that if you use a grid layout to build a town consisting of tall buildings on a planet with a certain axial tilt which orbits the sun in a certain way, this is the effect you get. And at some point, someone will notice. Manhattenhenge – © Roger Rowlett. For an example of deliberate alignments which are none-the-less indecipherable, a look at Ian Hinton’s work on the orientation of churches is recommended. He surveyed around 1,500 churches across England and Wales in a bid to uncover the truth about them being aligned with the sunrise on their patron saint’s feast day. Even taking into account such factors as calendar drift and rededication, the relationship between the alignment and the feast day could not be convincingly demonstrated. Though they all, broadly speaking, face East (83% are aligned to within 15 degrees of East), only 20% are aligned to within 15 degrees of their patron saint’s feast day. Additionally he discovered a high amount of regional variation – churches in the West had a much higher tendency to deviate towards the north – so high in fact that pure coincidence can probably be safely rejected. So although he confirmed that churches face East, they only sort of face East, and for some reason the builders of the West constructed their churches with a significant deviation towards the North. And even with the benefit of vast amounts of ecclesiastical documents available, no one has a clue why this is the case. Well what’s that got to do with it? It was really intended as a demonstration that although a group of objects may share a common alignment, the significance of that alignment may not be apparent. Alignments can be meaningless (Manhattanhenge) or they may have lost their meaning (East facing churches). For instance in the past it was presumed that Stonehenge, being aligned with the winter and summer solstices, was something to do with sun worship. The example of church builders aligning their work towards the feast days of the saints, though proving unsupportable in this case, is valuable in that it shows that aligning a monument with a solar event need not be about celebrating the solar event, but rather marking it in relation to another event – using it, if you will, as a calendar rather than an object of worship. However, being too concerned with meaning is, though it sounds pessimistic, bound to be fruitless. If the feature at the bottom of the Avenue turns out to be an oval, it’s a good match for the internal oval at Stonehenge, and the internal oval at Woodhenge. Currently it’s no more than an observation –for the moment, it fits in with two areas in which reside monuments of the same shape and orientation. These, according to a developing hypothesis, are the territories of the Living, and the territories of the Dead. . .
Wood for the living, stone for the dead – following the river of death downstream (with apologies to Art Garfunkel). At Stonehenge (the territory of the dead) there is no evidence for occupation by the living – it is in fact the largest prehistoric cemetery in Britain, and the focus is a monument consisting of stone. At Durrington Walls (the territory of the living) there were a large number of Neolithic houses, evidence of feasting on an enormous scale, and the monuments were constructed of timber. Stonehenge – © Adam Stanford. 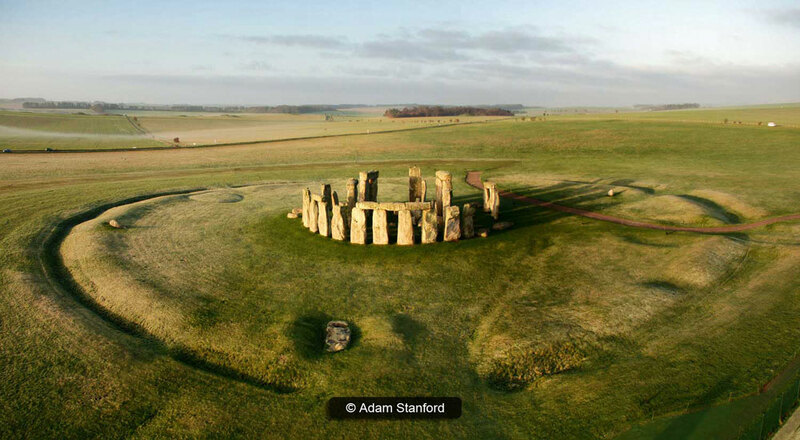 To add weight to this idea, Mike Parker Pearson (the man who first applied this hypothesis to Stonehenge) and the Stonehenge Riverside Project team had to identify a connection between the two territories. This they duly did – during the 2004/2005 excavation, they discovered that Durrington Walls was connected to the river Avon by way of a wide chalk road, pounded to a smooth surface by the passage of many, many feet. From there the river flows in a Westerly direction for 4.1 miles (6.958 kilometres) before it meets the lower end of the Avenue,a 1.678 mile (2.70 kilometre) long linear bank and ditch enclosure that begins at Stonehenge, and presumably terminated at the banks of the river Avon. At this point of the project, however, it wasn’t clear that the Avenue actually ran as far as the Avon at all – it appeared to stop on the Northern side of a group of buildings some 230 yards (210 metres) short of the proposed target. Coring samples and geophysics soon established that the twin lines of the Avenue did indeed reach the banks of the Avon – the river could now be identified as the connecting route between these two sites. 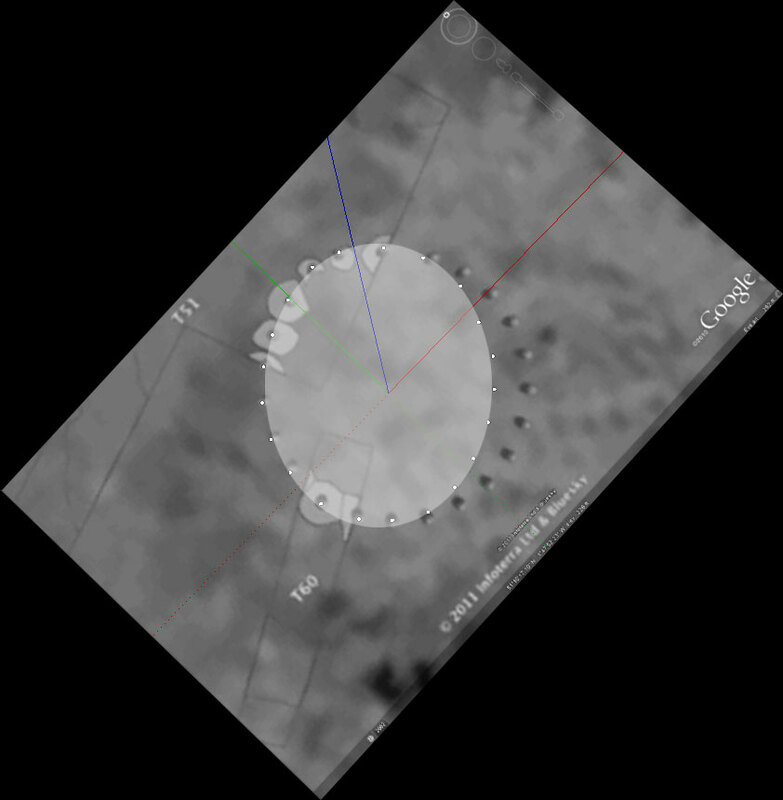 The geophysics also indicated that there was potentially something of great interest at its terminus – a truly unexpected bonus in the form of an anomaly which would eventually come to be called ‘Bluestonehenge’. The Time Team graphics crew, working on early data, initially interpreted it as a large upright dolmen, and then a set of four upright stones. Once the excavation was completed it was regarded (and reconstructed ) as a stone circle. 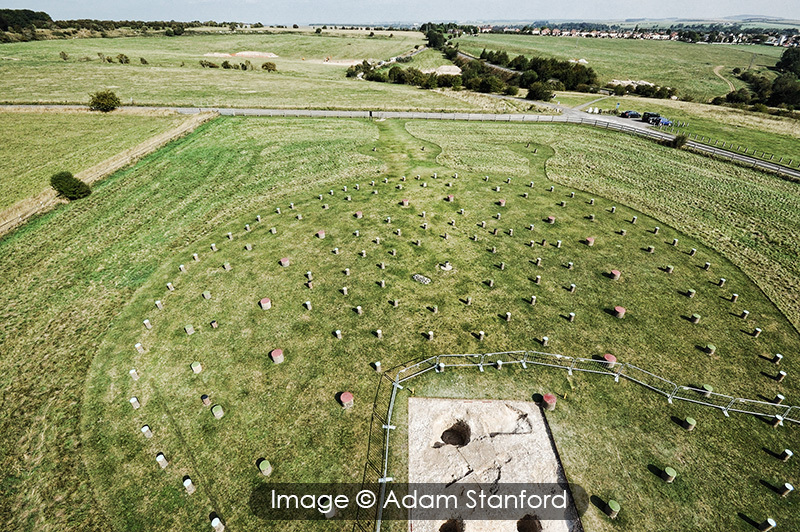 Now the game is on again – potentially identifying it as an oval has provided another connection between Stonehenge and Durrington Walls – the shape matches known monuments from both territories. Whether it provides a connection with a third monument – Bedd Arthur – is not so clear. As has already been pointed out here, although the configuration is different, the alignment and size displays definite similarities with Woodhenge, and the materials used are the same as the Oval inside Stonehenge. What is clear however, is that there a plenty more discoveries to be made – the story is far from over. 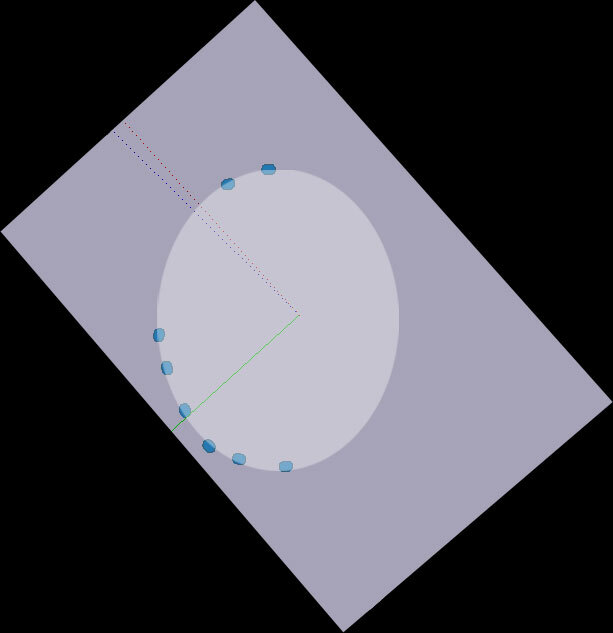 Oval imposed over excavation plan. Oval imposed over excavation plan, with new interpretation in place. Oval imposed over excavation plan – viewed from below. 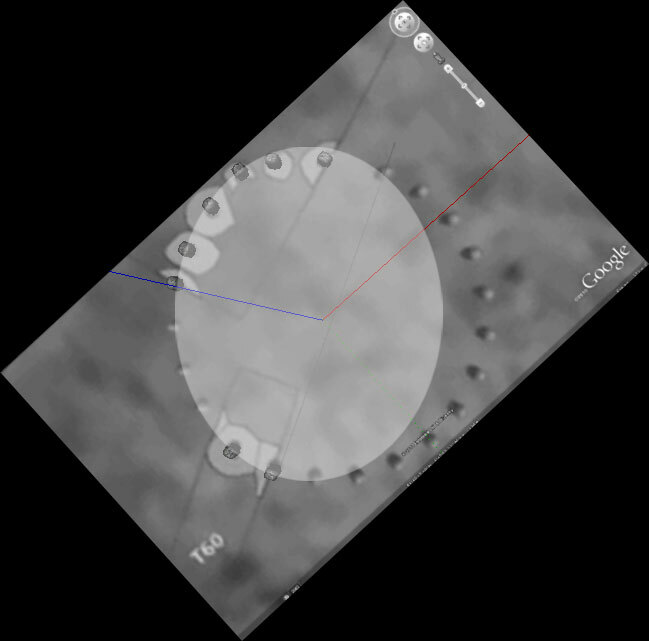 Within a day or so of the release of the oval model, a preview video of the Stonehenge Riverside Project/Bournemouth University Google project was released, which showed Bluestonehenge sitting within the actual excavation plan – the builders of the model had depicted it as a circle. 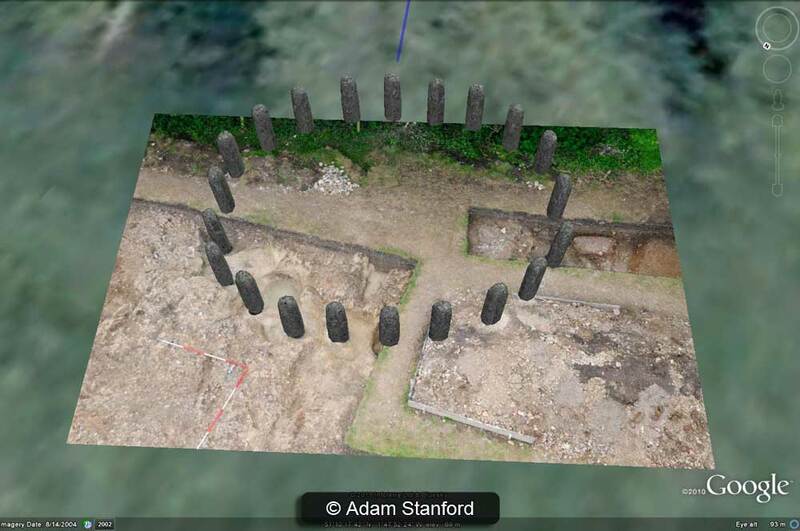 Having (rudely) taken a screengrab of the excavation plan, I imported it into Sketchup and added bluestone pillars only where the stone holes had been excavated. You can judge for yourselves by the images provided here, but I was satisfied that my oval interpretation still acceptable. A future dig might prove one, or possibly both models wrong – uncertainty is a constant companion to archaeology, but that’s not such a bad thing – in many ways it’s also one of the properties which makes the discipline so stimulating. If you’d like a fully referenced PDF of the write-up, you can download it here. The Digital Digging Facebook Page. Digital Worlds Episode 01 – The Iron Age Project. Your “oval” is an isometric circle! Change your plane of observation and you’ll realize it..